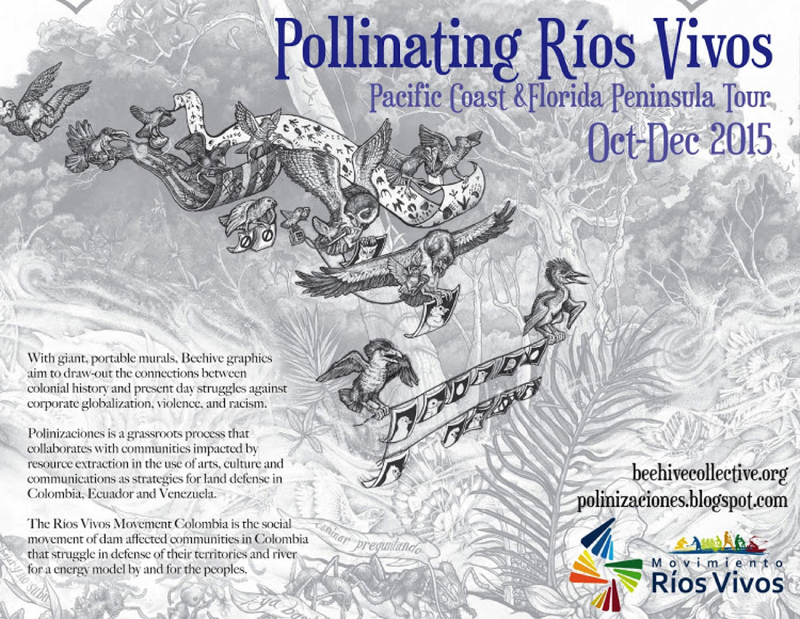 Once again, this fall a visiting Bee from the Polinizaciones project in Abya Yala (South America), who is also a member of the Ríos Vivos Movement in Colombia, is heading out on tour to the Pacific Coast of Turtle Island (North America) and then onto the Florida pensinsula (southeast US). This collaborative tour will share stories from Ríos Vivos Colombia, the social movement of dam impacted communities that struggle for the defense of their territories and rivers, and for an energy model by and for the people, and also the work of Polinizaciones, a Beehive grassroots process that collaborates with communities impacted by resource extraction in the use of arts, culture, and communications as strategies for land defense in Colombia, Ecuador, and Venezuela. Using Beehive graphics and other culture and communications work, Polinizaciones creates another way to learn, create, and understand our history in the context of globalization and free trade, militarization, the war on drugs, and the infrastructure and extraction projects integral to IIRSA-Project Mesoamérica. The Polinizaciones sharing session will highlight the Beehive’s giant banners, accompanied by photographs, short films, personal experiences, and stories about the communities in resistance we have been weaving relationships of mutual aid with over the last eight years. We seek to cut out the constant queries of “who made that?” and “how much does it cost?” from our creative process. We work anonymously by crediting every graphic we make to the collective as a whole; you won’t find the names of individual artists listed anywhere. We distribute our graphics by sliding scale donations, and we try to give away roughly half of the materials we print to frontline communities, educators, and organizers actively working on the issues in the posters. We build and disseminate these visual tools with the hope that they will self-replicate, and take on life of their own. It gives us a huge surge of energy knowing that others are taking the helm and using these graphics in their own communities. To make this abundant cross-pollination possible, all of our work is licensed under the Creative Commons (CC). At the core of our group, there are usually 10 to 15 Bees committed to moving our work forward on an ongoing basis. We also have a strong decentralized network of part time bees whose contributions are integral to what we do. Some of us are based on the coast of eastern Maine, where we are involved in many local revitalization projects, while others are spread out across the map. Together we work to find creative ways to collaborate and make both our local and global vision of the Beehive a reality.